L'il Dee's Crafting with a Kitten: Summer Fun!!! Well Summer is officially here but the weather isn't exactly co-operating. It has been rainy and cloudy here for most of the week. I haven't had a much time to spend in my craft room this week. You know, I say that every week lately! I don't seem to have much spare time at all recently. I really need to schedule my time a little better it seems. Oh well, I did manage to get my craft room all cleaned up and organized so that I can actually function in there. I have been working on cards for my husbands store, but they are all repeats of designs I've posted before. Coming up with new designs seems to be a real challenge for me right now. I think I have a case of crafter's block. So I decided to head over to the Kraftin' Kimmie challenge blog and see what kind of inspiration I could find. 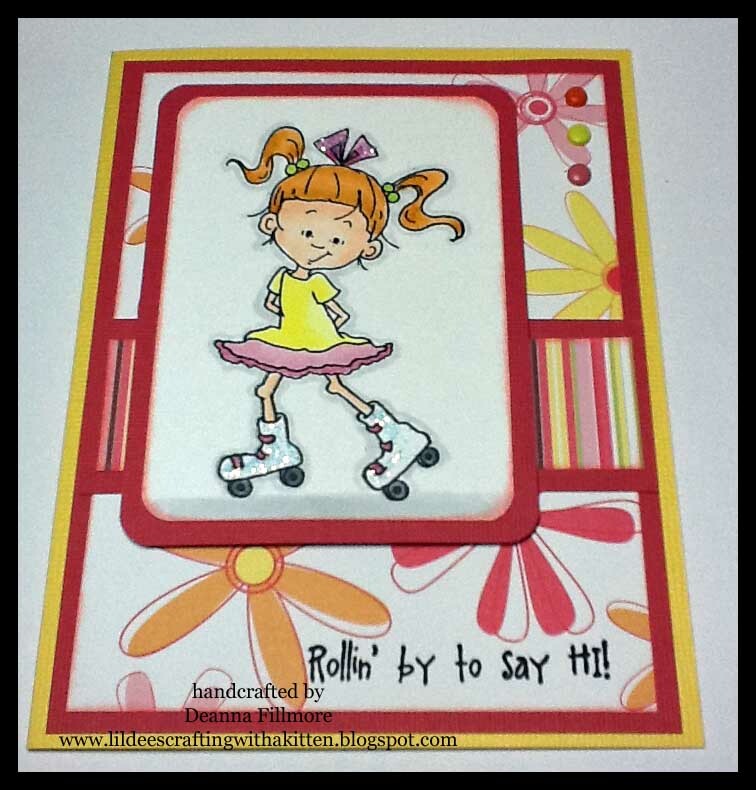 I also received my stamps from the Kraftin' Kimmie challenge I won a few weeks ago and I really wanted to use them. The stamps are from the "Lulu on the move" set. This week the challenge is Summer Fun - it didn't have to be a summer image but use bright summer colors. I thinks the colors from these papers by Three Bugs In a Rug papers are nice and bright for summer. I actually picked the papers first and then picked copics to match it (YR00, 12, 14, 24 - Y00, 02, 04 - E00, 01, 02 - R81, 83, 85 - N1, N5 & YG25). I also used some diamond stickles on her hair ribbon and skates. I edged the picture and patterned papers with pink grapefruit versa magic chalk ink. I used a corner rounder punch on the corners of the picture and the mat. 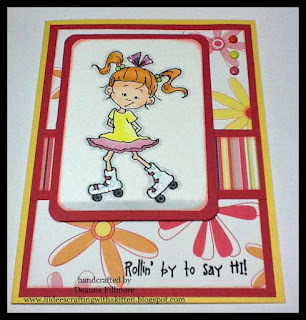 I stamped the greeting with ranger archival ink and added a few brads for some fun embellishments. I used 3d foam dots to attach the main image. That's it for tonight, I will be back with another post tomorrow. I have to post 2 more projects this week to make up for only one last week. Have a great Friday everyone and thanks for stopping by. Your card is perfectly summery! Love those papers and you coloured Lulu amazingly! Thanks for playing along with us at KKS!